Natural stone is an element that homeowners often overlook when making DIY landscape plans. The sublime qualities stone brings to the yard and garden come from its “naturalness.” Being a natural material, unlike concrete, stone looks like it belongs there and helps to anchor the entire look and feel of the landscape. ● Add accent boulders to landscape beds. ● Use pea gravel, slate chips or other types of small stone for mulch. ● Create a pathway “paved” with decorative gravel and/or flagstone. ● Convert a drainage swale into a dry creekbed with variable sizes of river rock. ● Use thick stone “steppers” to tame a sloped pathway. ● Build a decorative wall, or even a functioning retaining wall. With seemingly endless types of stone available in a wide range of prices, I recommend creating a plan before making a purchase. You can create a look that blends in with the local surroundings, or you can make your landscape look more exotic. The object should be to suit your own tastes while considering factors such as architectural design, color palette and even plant selection. A great way to incorporate a sense of permanence is by observing the look of the natural stone outcroppings in your area, and purchase stone in colors and textures that complement your surroundings. 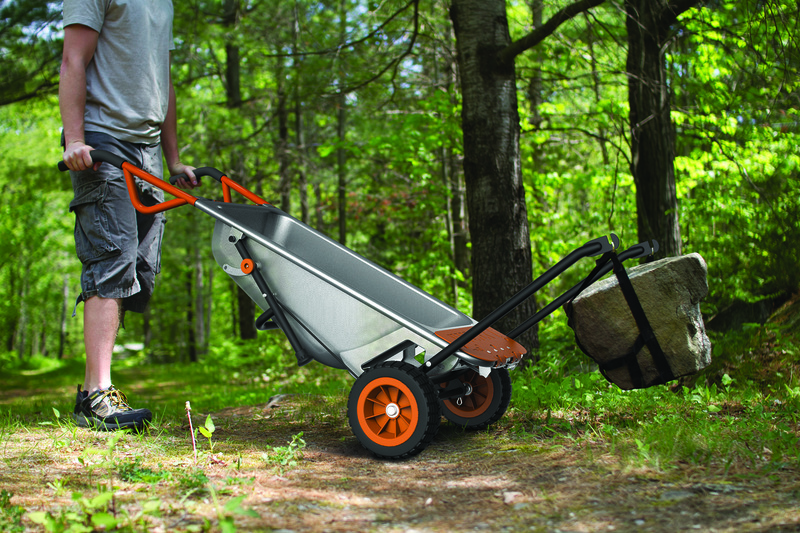 ● WORX Aerocart is capable of hauling loads of gravel or picking up individual boulders safely and with far greater stability than a standard wheelbarrow. ● Round point digging shovel is a must for any landscape job. ● Plate tamper packs the soil for a firm, stable foundation. ● WORX Edger Trencher cuts a clean edge to define beds and pathways. ● Hard-toothed rake smooths soil before stone is laid, and smooths gravel at the end. ● 4-foot level is a necessity to ensure that pathways, patios and walls have structural integrity.